“Denying any Propofol use to medical personnel and investigators indicates that Murray knew, with malice aforethought, that Propofol use was dangerous, inappropriate and unprecedented for treating insomnia. ‘A killing caused by dangerous conduct and offender’s obvious lack of concern for human life’ defines second-degree murder. When Murray decided to invent a dangerous insomnia machine, setting up an anesthesia operatory in Jackson’s bedroom without proper training, experience or certification, he committed second-degree murder. Q. Investigator Fleak, you see two separate tables next to the bed? just to the side of that [brass trolley] Is that right? [brass trolley], did you recover a syringe? Q. When you say syringe, what are you referring to? Q. 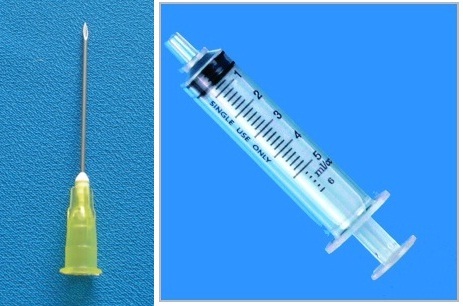 To which you would attach a needle? While Michael Jackson wrestled death, instead of calling 911 or trying to save his patient, his high priced doctor, Conrad Murray opted to clean up crime scene. Q. To be clear, 911 had not been called yet? Q. Did you notice anything about the IV bag that caught your attention? Q. Separate from the bottle, you are talking about a liquid? Q. You saw a bottle literally inside of the bag? of the bag? Was it floating in liquid? On June 29, 2009, Elissa Fleak returned to the crime scene to recover more evidence hidden in a closet, including a slit saline bag which held a 100ml Propofol bottle. Q. Did you find a saline bag that had been apparently cut open? Q. Did you find anything in that saline bag? Q. If I zoom in on the picture, does this depict the cut within that saline bag going from top to bottom if the IV bag had been hanging on an IV stand? Q. That is the Propofol bottle contained within the IV bag? Q. Was there still ANOTHER IV bag hanging from the IV stand? Q. Did Doctor Murray instruct you to remove that bag? IV bag did NOT have any drugs in them. There was syringe stuck and depressed at the Y connector. The syringe tested positive for Lidocaine, Propofol and Flumanezil. Short tubing also tested positive for Lidocaine, Propofol, and Flumanezil. Q. What happened at that point, according to Dr. Murray? Q. Did he indicate that was for dermatological condition? Q. Following that, according to Dr. Murray, did he begin using an IV? Q. For what purpose, according to Dr. Murray? Conrad Murray also told paramedic Richard Senneff and UCLA ER Doctor Richelle Cooper that he was treating Michael Jackson for dehydration that night. 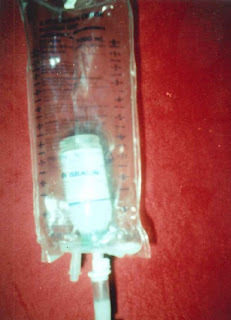 Conrad Murray needed a system where he can dehydrate Michael (with saline), inject drugs boluses (via Y connector) and provide a continuous Propofol IV infusion (by spiking a Propofol vial to the IV system). This cannot be done by using only one IV set. 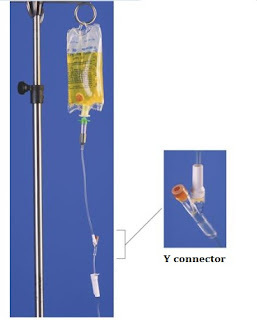 It requires the use of TWO IV bags, piggy-backed. 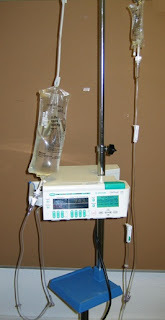 If a patient is receiving continous IV fluid (saline for dehydration) and in addition, he must receive a second kind of intermittent infusion (Propofol) then we will need 2 sets of IVs and we will need them connected. Conrad Murray ordered only 9 saline bags on April 6, 2009. His next order of 12 saline bags was on June 15, 2009 so he used only 9 saline bags in 2 months. Had Murray been ordering saline bags for hydrating Mr. Jackson, he would have ordered MORE. Disclaimer: The following is a speculation based on limited publically available information. It aims to make sense of the “broken needle” and the contraption (slit saline bag with 100ML propofol vial inside) found in the closet. The veracity of this conjecture requires affirmation that: (1) Murray was using a non-vented IV tubing (2) there is a needle stuck in the 100ML propofol vial which was in the slit saline bag recovered from the closet. Conrad Murray didn’t just invent a new medical treatment for insomnia. He also invented a “medical equipment” to accompany his so-called medical treatment. This arts and craft project which dripped an anesthetic into his patient’s vein without an infusion pump was incriminating evidence, testament to the substandard care Murray provided to his patient. 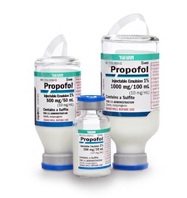 the size of the Propofol bottle (25ml, 50ml or 100ml), only %1 of the mixture is active Propofol. 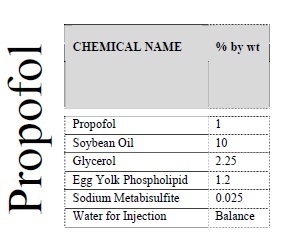 Propofol has high fat content due to oil and egg yolk. Because of its high lipid content, Propofol is susceptible to bacterial growth. To deter contamination, Propofol comes in vacuum vials, topped with rubber stoppers. 50ML and 100ml Propofol vials come with a hang so they can be hung to IV stand for continous infusion. Withdrawing drug out of a vacuum vial is tricky. To equalize the pressure, you must push an equivalent amount of air into the drug vial for the amount of fluid that is to be withdrawn. For instance, if you would like to draw 10ML Propofol, you would pull back the plunger of your syringe to10ML to draw air into the syringe, push the needle into the rubber lid of the vial, turn the vial upside down and then inject the air into the vial. the vial and an infusion pump to regulate Propofol flow. Conrad Murray wasn't using an infusion pump. Making an educated inference based on the arts and crafts contraption found in the closet (saline bag with Propofol vial inside) Murray wasn't using vented tubing either. Murray told the detectives that he was becoming concerned that Michael was becoming addicted to Propofol. On June 22, 2009 Murray allegedly “INTRODUCED” Lorazepam and Midazolam as part of his “weaning” process. 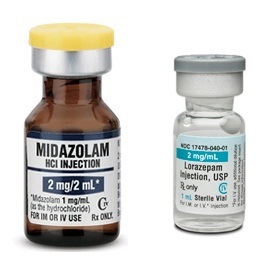 A quick look at Conrad Murray orders disproves his allegation that these 2 drugs entered into the treatment for “weaning” purposes. They were very much part of his “treatment”. Assuming he only had non-vented tubing and he can't just spike a Propofol vial to the IV line, Murray had to find a way to ventilate the Propofol IV line so the drug could drip. Conrad Murray needed a continuous air flow into the 100ml Propofol vial. 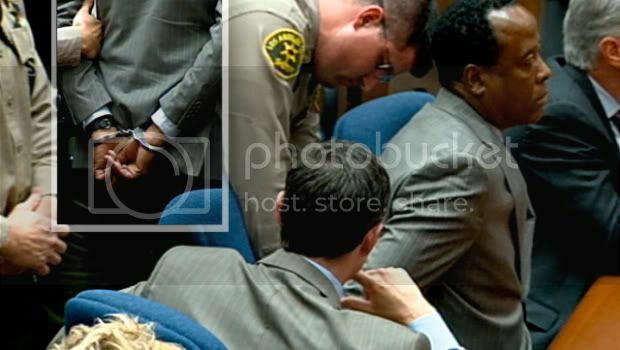 Conrad Murray detaches the needle from the syringe. 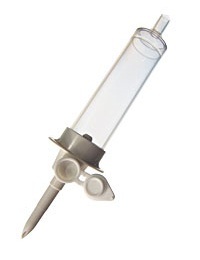 Needle hub would provide flow of air into the vial, sparing him from injecting air into the vial continuously. But there is one problem he needs to overcome. 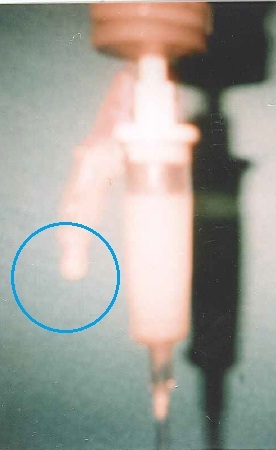 Propofol is leaking from the needle hub. "Focusing on the milligram dosage that killed Jackson diverts attention away from Murray’s gross negligence. What killed Jackson was an arrogant physician playing with anesthesia without proper training & experience"
Cover-up in Michael Jackson Death? Murray was so adamant in hiding instead of giving a proper CPR or calling Emergencies straight away. However, the plastic top part of the separated syringe contained propofol and lidocaine as well. Many times I have thought that it was Murray the one who put both substances into that syringe so as to later blame the victim and use that separated syringe as the "instrument" for his crazy theory... (hence their lawyers asking for re-testing syringes for amounts). What is your point of view regarding the content of that "broken" syringe? @Smoothluger Yes, the syringe barrel did have Propofol and Lidocaine. Murray told police that he first does a bolus injection to put Michael to sleep then continuous IV drip to keep him asleep. 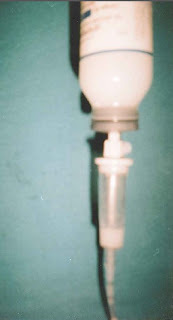 The syringe was likely used for a bolus injection, THEN it was detached from the needle for the purpose of ventilating a non-vented tubing for the Propofol infusion IV. I received some information last night and today I was doing searches to confirm when I ran across your blog. Can you contact me? I'd like to know how you received your information. Everything you have here I received as well. Also, I'd like to know if you are the one involved with the children's hospital. Thank you for all of this. It's overwhelmingly amazing!